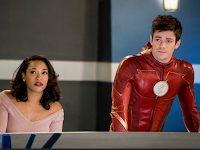 DANNY TREJO RETURNS AS BREACHER; KEVIN SMITH DIRECTS — Barry (Grant Gustin) and Ralph (guest star Hartley Sawyer) take different approaches to finding the remaining bus metas before DeVoe gets to them. However, Ralph’s cavalier attitude frustrates Barry and the two clash over what it means to be a hero. Meanwhile, Breacher (guest star Danny Trejo) returns to ask Cisco (Carlos Valdes) for a favor. Kevin Smith directed the episode written by Lauren Certo & Kristen Kim (#417). Original airdate 4/10/2018. Following The Flash is The CW's second back to back night of DC Television in the shape of Black Lightning at 9pm. It's been doing surprisingly well on its own in The Flash's absence, so much in fact that the renewal news didn't come as any surprise. On FX meanwhile, you can catch the second episode of the magnificent Legion's 2nd season. The show is befuddling at the best of times, but of the absolute highest quality with marvelous acting, scenery, directing & visual effects. David meets his oldest enemy. Written by Noah Hawley & Nathaniel Halpern; directed by Ana Lily Amirpour. Also on Cable is Shadowhunters on Freeform at 8pm. You can of course find out more about the episode here and having already seen the episode, I can say it's an absolute firecracker. Across the sea and on ITV at 7pm you can watch the 2nd of this weeks Emmerdale installment. Jimmy lets his past catch up with him, while Charity is forced to confront hers, opening up to a horrified Vanessa about her dark secrets. Laurel faces the consequences. At 7:30 on BBC 1 you can watch the 2nd of this weeks Eastenders as Phil is forced to deal with the repercussions of the night before. Hunter overhears his mum and Phil talking about their past, leaving him upset - and an attempt to apologise to Phil does not go as well as he might have hoped. Whitney gets a shock when Woody returns to the Square and does all she can to avoid him, the Slaters find an interesting letter when they are employed to clean Kim's house, and Mo's psychic abilities leave the locals bamboozled. Greg and Marie hurtle towards a divisive family court case. As the narrative jumps between the past and the present, flashbacks reveal more about their life together. The custody battle forces them to examine the choices they've made and the impact of their behaviour. Drama, starring Christopher Eccleston and Paula Malcomson. Last in the series.